Note: Originally this was written for the radio. See link at CREDIBILITY for more information. Next, let’s see the role of 4. POSTURE. a message. Are you standing straight? Shoulders level? forward? If so, you’ll be communicating confidence. The next way to make a good impression involves Time. That is, being ON TIME, ALL THE TIME. When you arrive late, it communicates some carelessness and lack of professionalism – without even saying one word ! Also, being late can spoil your performance because you’ll be nervous on the inside and it will show in what you do and say. A simple solution is to have yourself and everything you need ready well before the due time of your meeting, lecture, presentation, speech or whatever is scheduled. and 55% to the body. Another tactic, along with effective posture, is keeping eye contact with your listeners. Do this as soon as you enter, rather than looking down to the floor or out the window as you walk to the front of the room or take your seat at the conference or meeting table. Now, let’s look at some details. The best-prepared oral presentation must have the best beginning. And, that first impression starts with your entrance into the room. First of all, I recommend that you see the place you’re going to speak and present in –But remember, you should do this BEFORE the presentation day, or at least a few hours before the scheduled time. This’ll be easy in your own company, but what about a client’s office or a hotel conference room in another city? No problem. Just make a polite phone call to your customer. Tell them sincerely about your desire to do the best job for them, and request to see the place where you are going to give your presentation. If it is a competitive presentation (with other companies trying to get the business along with you), then perhaps this strategy won’t work. But even in this case, it can’t hurt to ask! In a hotel or conference center, a call to the Meeting and Sales Director or the Meetings Coordinator should solve your problem. So, what are the benefits of seeing the room ahead of time? You can become familiar with the way the door functions, the seating pattern, tables, chairs, electrical outlets and other equipment (like the projection screen) that are there. With this information firmly in mind, BEFOREHAND, you can enter the room with full confidence – and Prior Knowledge – on presentation day. One last tip about entering. Make sure your buttons, zippers, necktie “ghutra” and “aghal” are in place and ready. It’s not flattering to you to be straightening yourself out in front of your boss or customer. Do it before you enter the room, in privacy. Fumbling with your clothes or equipment in front of your audience before you begin, creates an impression that you are unprepared, and unprepared equals unprofessional – a curse worse than death in the business world. Details can be found in many books and on the Internet. With regard to number 1 (multi-cultural workforce), the best advice for most supervisors and managers is to reflect the cultural expectations of your listeners or your officemates (especially the boss). That means conservative colors and styles in line with Islamic principles of modesty and good taste. However, avoid wearing the clothes of the host country for business. For example, if you’re from Chicago and your boss is from Riyadh, it is not recommended for you to wear an Arabic “thobe”; the best choice is your normal Western suit of clothes. The general principle is as follows: “it’s better to be dressed up rather than dressed down.” That means wearing a shirt and tie (and even a jacket) with dress trousers can only help your impression. However, the environment does not always cooperate. And that brings up point number 2 (the weather) and a few obvious recommendations. The heat of Saudi Arabia and the Gulf, along with the high humidity of some areas, prevents most people from wearing a full suit of clothes. So, that is why we see in many places that an open-collared shirt and dress trousers can be acceptable in most cases. One tip, though. My experience has shown that in the air-conditioned offices of most businesses, the full Western suit and tie are the norm even though the outside temperature is well above 37 degrees. The 3rd point (your status and type of business) is also influential in creating a good first impression. Colors can create an image about you, just like anything else we have been talking about in this program. For example, it is wise for you to know the different tastes and traditions of the people from different parts of the world. My own research shows that black is acceptable and sometimes even preferred for business among Gulf and Middle Eastern-born managers and executives. But, their Western-born counterparts and customers consider black inappropriate for business. For them, black is traditionally used only for funerals or formal evening occasions. foot doctors say “no.” The sock color makes no difference, hot or cold, once the foot is inside the shoe. On the other hand, the impression created by accessories such as fine watches and pens is international. So, it is important to pay attention to this factor. But, as with all things, good taste and a traditional approach is always the best path to follow. While you’re speaking, you want to be heard and listened to, and that brings us to our last point. And, that is your Voice. Voice. What a wonderful tool! Did you know that the tone of your voice, its pitch, speed and clarity all contribute to making a good impression? It’s so true. When you begin to speak, many times, listeners become interested in a speaker’s words just because it’s so obvious that the speaker is very interested and enthusiastic about his topic. Also helpful is speaking in a natural flow of words, sometimes slowly, sometimes quickly, then loudly and other times softly. These tactics add drama to your voice and bring emphasis to your important points. Most of all, though, in our multi-cultural and multi-lingual society in the Gulf, speaking clearly is most important. This will create the best impression, because clarity allows your audience to hear each word – and ultimately to understand your important ideas. So by following these suggestions, I hope you are on your way to making a good impression on your first try – because it IS impossible to get a second chance to make a good first impression. Let’s review for a minute about our main points of making a good impression at your next presentation. Actually, it was how to make a good FIRST impression in the way you look, what you say, and how you move. We learned about posture, clothes, tone and volume of voice. All of these are directly related to how effectively you communicate your intended message. And, how well you are evaluated by your boss, customers and any audience that listens to – and looks at – you. And as a final point of review, a valuable statistic which supports the importance of these elements of communication , was quoted last time. You may remember that I said, audiences paid attention more than half the time to the speaker’s body movements rather than the words themselves. Specifically, the study found that people pay attention 7% to the words; 38% to the voice; and an overwhelming 55% to the body movements. How many times have I heard this from colleagues at work, executives I’ve coached and university students I’ve taught? It’s so many I’ve lost count. What to do? The answer is found in the way you stand. Instead of facing your audience straight on [ what I call “facing flat”] directly with the full front of your body, legs and feet pointing right at the people, try moving your body slightly to one side. Let me explain. If you are listening at home, stand up and face a lamp or the TV or the radio your listening to right now. If your in your car, try to imagine the scene. 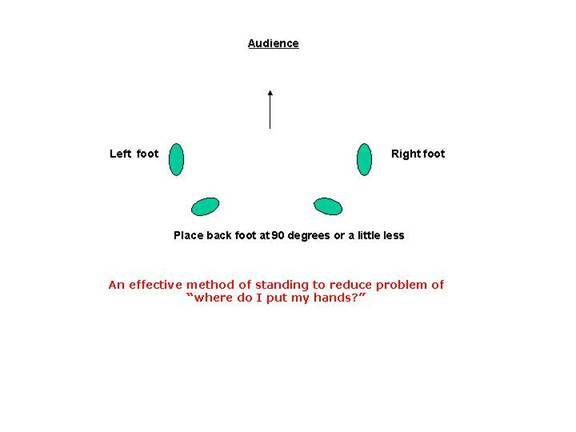 Stand with the toes of your left foot directly toward the audience, and place your right foot at a 90-degree angle behind your left one. You can do the same using the opposite feet (put your left foot in front and your right foot behind). If 90-degrees is not comfortable for you, you can decrease the angle. But try not to decrease to less than 75-degrees. OK. Now, look at your hands and arms. If you followed my directions correctly, your body should be facing slightly to the right. Your left hand and arm should be resting naturally and comfortably against your left thigh . Your right hand and arm should be resting naturally and comfortably against the side of your right thigh. You can do the same if you prefer to have your right foot in front and your left foot behind. The procedure would still be the same. Now, what are the benefits of using my method of standing? The first you have already seen. Your hands and arms are in a natural position, comfortable and out of the way. My method makes the uncertainty and awkwardness disappear. Keep standing. The next benefits will become clear. If you use note cards, you can keep them the hand that is resting on your back leg out of the way and less distracting. The hand in front can be used effectively for gestures. Or, the hand in back can be used to point at the projection screen. A final benefit of this standing tactic also eliminates another distracting movement that I call “The Rocking Boat” – shifting from one foot to the other and back again. Rocking left and right as you speak. This common distraction is the unfortunate result of standing “flat” to the audience with both feet parallel (much like a soldier stands). In addition, you can add power to your words by using your hands to emphasize meaning. For example, showing three fingers and then using them one by one to count out points 1st, 2nd, 3rd (which is a form of Kinesics called Enumeration) is very effective. Or, opening your arms widely can increase the size of your description. Bringing your thumb and index finger together can indicate the size of the tiniest object, or the smallest point. Just as you can manipulate your voice from loud to soft or fast to slow to emphasize and idea, you can walk closer to your audience when you talk about important information (this relationship between the closeness or farness you to the audience, or the arrangement of seating or tables is called Proxemics). Move closer and the facts become more important. Moving back will open a wider perspective, a range of eye contact and the opportunity to open the presentation to discussion or questions. The impression that this tactics communicates is that you are in control of the flow of information and the entire action of the presentation. There are other effects of PROXEMICS (regarding standing and sitting, the setup of the room, the relationship between people, people and furniture, and several other relationships – but this factor is most important for a PRESENTER. These examples of Kinesics and Proxemics, most of which come naturally as we speak, are very effective tactics for presenters. You must think about them, plan them and analyze what will be most effective. Then select the Gestures that will add power to your words and create the most effective impression. Be natural, of course. But, a rightly selected gesture or movement of proxemics at just the right time, connected to just the right word will really capture the attention of your audience and create the most effective and professional impression about you and your topic. will really capture the attention of your audience. A few words of caution, however, especially when you are speaking to an audience of mostly foreign, non-Arab business people. Gestures, as you may realize, can get you into trouble if you do not consider the cross-cultural aspects of them. For example, the common hand gesture in Saudi Arabia and throughout the Middle East for “slow down and have patience” has a different meaning in other countries. Furthermore, the hand gesture for showing a small or large document or official paper can be quite embarrassing when it is done to a Westerner who is not familiar with this gesture. For him, it has an entirely different and vulgar meaning. Based on Culture and Environment. Finally, remember that you can only have one chance to make a first impression – so make a it a good one. A careful review of these items long before the day of your presentation, will help you to create the best impression you can the first time . . . because you never have a second chance to make a first impression.